ArcGIS Spatial Analyst extension modeling focused on the identification of areas with the potential for site preservation. Site suitability analysis enters geographic variables into a GIS model. Survey efforts in other areas and time periods can benefit from predictive modeling. 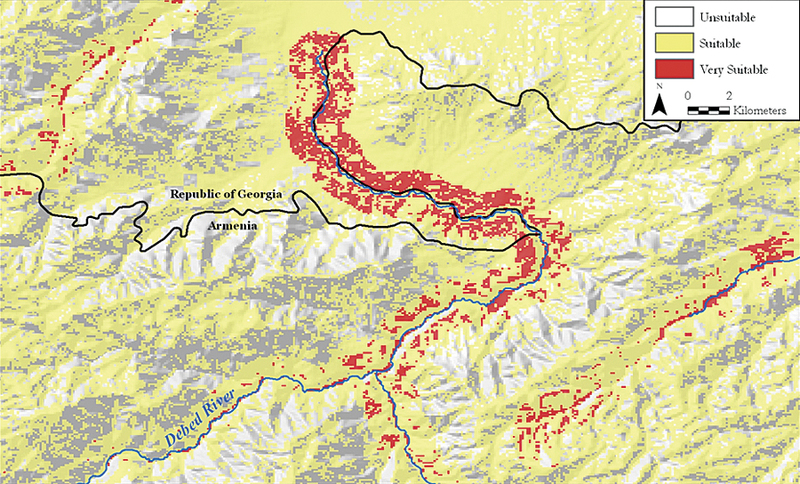 The southern Caucasus mountains (which includes the modern republics of Armenia, Azerbaijan, and Georgia), nestled between Africa, Europe, and Asia, has served as an important thoroughfare for human populations throughout the Paleolithic period (about 2.6 million to 12,000 years ago). Although the region has a rich record of Paleolithic research, many of the sites have not been analyzed with modern archaeological methods. Therefore, the identification of new sites in the region that can be excavated and analyzed with modern techniques is imperative. Relative to sites of later time periods, those of Paleolithic age are typically rare and nondescript. 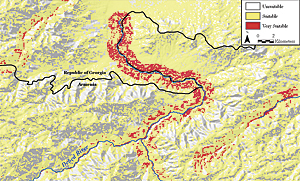 Raster map of site suitability scores for the Debed River Valley. With Esri university site licenses, researchers from the University of North Carolina, Greensboro, and University of Wyoming, with the National Academy of Sciences, Republic of Armenia, utilized ArcGIS for Desktop with Spatial Analyst to predict the location of Paleolithic sites in northern Armenia. The ArcGIS Spatial Analyst modeling focused on two issues: the definition, in a very broad sense, of potential survey regions and the identification of areas within the survey region with good potential to preserve sites of this remote age. One of the major sources of Eurasian populations throughout the Paleolithic period was Africa. Therefore, a theoretical migration route between northeast Africa and the Paleolithic site of Dmanisi (Republic of Georgia) was constructed. Dated to about 1.8 million years ago and preserving both stone tools and the fossil remains of extinct animals and Homo erectus, Dmanisi is the oldest well-accepted evidence for a human presence outside Africa. A simple cost path analysis (CPA) model was employed, which determines the path from a source to a destination while taking into account impediments to travel. Assuming that humans would have selected a path that minimized the cost (energy) of travel, the goal of the CPA was to identify a least cost path (LCP). This function was performed in ArcGIS 9.3 using Spatial Analyst. The cost raster was represented by modern terrain (a digital elevation model), which created the "cheapest" cumulative route relative to cost. Based on this, the cheapest route runs northeast across Syria into western Turkey and skirts along the northwestern border of Armenia. Once in the Lesser Caucasus of northern Armenia, the LCP passes north before terminating at Dmanisi. Given its reliance on modern terrain, the CPA was not meant to predict the precise location of Paleolithic sites but rather to isolate potential survey regions. That the CPA matched well with the distribution of known Paleolithic sites in Armenia supports the idea that the region was an important corridor for the movement of Paleolithic human populations. 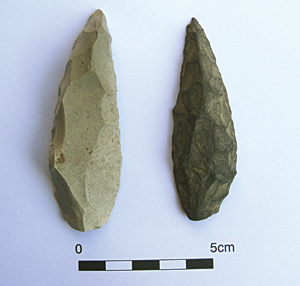 Middle Paleolithic stone artifacts from Bagratashen. The next step was to identify specific areas in or near the LCP for focused pedestrian survey. It was soon evident that northern Armenia's Debed River Valley was deficient in Paleolithic sites, despite the fact that numerous sites have been documented in surrounding areas. Given this and the river's location near the modeled LCP, a site suitability analysis was run. Site suitability analysis enters variables into a GIS model that geographically displays areas that are most (and least) likely to preserve sites based on suitability scores (the higher the score, the more conducive an area is to site preservation). The location of previously identified Paleolithic sites in Armenia was used to identify predictive variables for site location. The variables most closely associated with site location were slope, aspect, elevation, land cover, and proximity to rivers. Using a linear scale transformation (LST), numerical values for each variable were assigned based on the number of sites that occurred in a particular category. The LST values for each variable were then summed using the raster calculator and averaged to remove potential outliers. This resulted in a suitability score that ranged from 0 (lowest suitability) to 100 (highest suitability). In general, the highest suitability scores were associated with areas located near rivers, with low slope and relatively open vegetation. The calculated raster values were reclassified into three suitability categories: Unsuitable, Suitable, and Very Suitable. These values were then used to produce a raster map to visualize the potential location of Paleolithic sites in the Debed River Valley, which in turn served to focus survey efforts. Guided by the site suitability analysis, preliminary pedestrian survey during the summer of 2009 in the Debed River Valley identified 25 new Paleolithic sites spanning nearly two million years. Notable among these sites are Bagratashen 1, which contains a very well-preserved Middle Paleolithic (~100,000 years ago) stone tool assemblage, and Haghtanak 3, which preserves stone tools that are similar to those of nearby Dmanisi. There are, in fact, several areas with high suitability scores that have not yet been surveyed. Christopher Nicholson is the interim director of the Water Resources Data System at the University of Wyoming. Charles Egeland is an assistant professor of anthropology at the University of North Carolina, Greensboro. Boris Gasparian is a researcher at the Institute of Archaeology and Ethnography, National Academy of Sciences of the Republic of Armenia. For more information, contact Christopher Nicholson (e-mail: cnichol5@uwyo.edu, tel. : 307-766-3741) or Charles Egeland (e-mail: cpegelan@uncg.edu).